With the NBA season winding down, the MVP debate is starting to heat up. 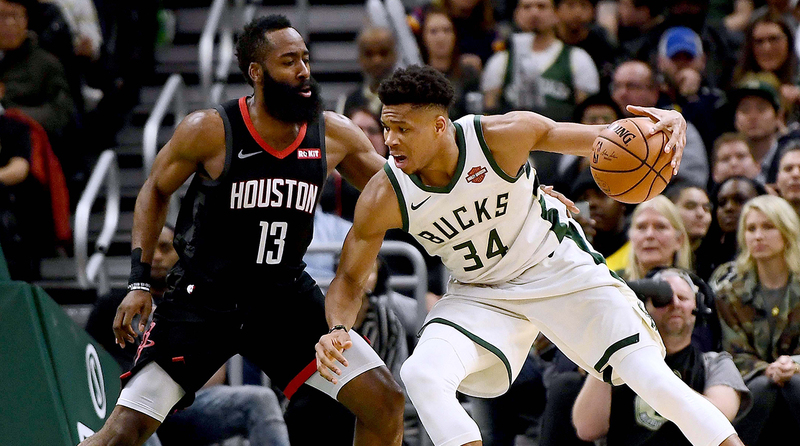 James Harden and Giannis Antetokounmpo are the clear front-runners and both have ramped about their campaigns on and off the court. On the latest Open Floor podcast, Andrew Sharp and The Washington Post's Ben Golliver talk through the MVP cases for both players, including Houston's adversity this season, Milwaukee's continued dominance, the source of Harden ambivalence, whether Giannis' numbers could be even more impressive, and why the race is still a toss-up as we enter the final weeks of the season. And the second question comes from Tony: “Dear Giannis Inc. some of the numbers that James Harden has been putting up lately has got me worried that recency biased is going to give Harden the MVP. How worried should I be?” So Ben, the floor is yours. Where do you stand on the MVP race right now? Ben Golliver: The first thing is Steven don’t be so melodramatic, like there was a bunch of ups and downs this season. Houston is in the fourth seed in the Western Conference, basically where most people expected them to be. Their win total is a bit lower than what people expected. It was shaky earlier on but I don’t think this was a turbulent season. When I went down there to visit the Rockets, I think in February, they had no Chris Paul, no Clint Capela and they were completely chill. They were like ‘We are going to be fine. We are still the biggest threat to Golden State, who cares?’ When it comes to the narrative thing, Harden has absolutely carried them but I don’t think it was like some hurricane storm that he magically pulled them through. Sharp: I feel like the reason the Rockets’ season hasn’t been as turbulent then it has is because of James Harden. I think if you look at some of the things that happened around the edges—even Chris Paul—he has come back and played well but he has had a lot of nights this season where you look and watch him put up the numbers that he is putting up and you are just like ‘whoa what happened here’. I think this is the first time that age has become a real factor and we are starting to see Chris Paul decline. And you see that they are putting faith in Gerald Green. Gerald Green is taking 10-15 shots a night and P.J. Tucker is great but probably shouldn’t be playing 40+ minutes a night. The only reason why any of this has worked is because it has been James Harden, so I guess my point is as far as the MVP is concerned he has a really good case and is not easily dismissed. Sharp: Harden had 60 the other night, it is pretty dramatic. [Laughs]. Golliver: Harden’s case is incredible. If you look at his per-game stats—he is averaging 36, six and seven right now—that line has never been done before in NBA history. Not Mike, not Wilt, not Kobe, not Westbrook, nobody. 36 points per game is one of the hallowed scoring averages that basically never gets touched and the way he has played recently, he is finishing strong. 51 points and 61 in consecutive games is absolutely no joke. He is going to be above that 36 points threshold and I think there is going to be a lot of voters that think this is going to be the most points someone has scored since Michael Jordan in 1987—automatic MVP vote. He just gets it no matter what. Houston is a four-seed currently and he is the reason why they are there. I just think that is the reason why his case is very compelling. Honestly, I wouldn’t blame them if you are talking about who has had the biggest impact on his teams’ offense this season, overall impact there is no question that it is James Harden. I don’t think it is the case for recency biased because Harden has been good for a lot of months now. This is not just about one incredible scoring week shifting the narrative. He has had a very steady case especially since December. I just think Giannis has a really, really, really strong case too and the one point I want to put out there on Giannis’ case is that it is similar to when I made in favor of Stephen Curry vs. Harden a few years ago in the MVP race. When your team is winning by a lot, that would come at the expense of your stats. You are not playing. You are not being forced to play 37 minutes per game like Harden is down in Houston. You should not get penalized and your opponent should not get bonus points for the struggle. If you are winning games easy that is better than winning games more difficult. I think that is one of the arguments in Giannis’ favor. Not only does he have incredible statistics across every chart but Milwaukee from start to finish has been the most dominant and consistent team on the court and that counts for a lot of my votes. Sharp: It is pretty interesting because this is a near perfect version of the 2016 debate between Harden and Westbrook except that now Harden has switched places and he is making the case that Westbrook stans had to make two years ago. Both of sides of this debate have stronger cases than either Russ or Harden in 2016. On Giannis’ side, the bucks are better than what that Rockets team was. And Harden’s side, Houston’s offense is the second best offense in the league and has been lights out for four or five months now with Harden playing this way. And Harden has had no choice to put up these numbers. You talked about his stats across the board but even if you limited it to since the time Chris Paul went out with that hamstring injury in late December, he is close to averaging 40 points per game. They have needed every bucket along the way. And they started that stretch outside the playoffs in the West and are now the third seed. So, I am kind of with you and it is kind of a meek take right now and I feel bad about it right now but anyone who feels like Harden is the MVP isn’t wrong because his case is so good and I cant argue with it and he is going out and having these lights out games where has 60 but it’s not stat-padding. The Rockets need him to do that.